… to me anyway. This morning I visited Pacheco State Park at the summit of Pacheco Pass between Los Banos and Gilroy. I’ve driven past here for years on my way to/from the Sierra, Death Valley, Los Angeles, but only turned off the road here briefly once a few years ago. This past week I read a post about wildflowers at this park, and I decided to check it out. I was on the road early enough this morning that I arrived at the park before the sun was up – so I decided to first take a quick trip down to the shoreline of San Luis Reservoir to check out a photo I’ve had in mind. Didn’t work, so I headed back up to the pass and turned off to the park. A short distance up the road from Hiway 152 I took the turn-off onto the short dirt road to the parking lot at the start of the trail to Spikes Peak and many other places. There was only one other car there when I arrived!. This trailhead is – at this time of year – in a beautiful green meadow area with wildflowers just coming up. Because I was carrying my camera equipment my hike was rather slow since I needed to stop frequently to unload and set up my tripod and camera and various lenses. Before I topped the small saddle at the far end of the meadow I had already stopped two or three times to photograph oak trees catching the first morning light. Two Oak Trees, Morning. Pacheco State Park, California. March 16, 2008. © Copyright G Dan Mitchell – all rights reserved. Although the hills and grasslands of central California have been starting to turn green for a few weeks now, the impossibly green season is now underway, with grasses coming up like crazy along with all sorts of other vegetation and many wildflowers. I stopped frequently to check out loads of flowers, though it wasn’t easy to photograph them due to extreme winds. 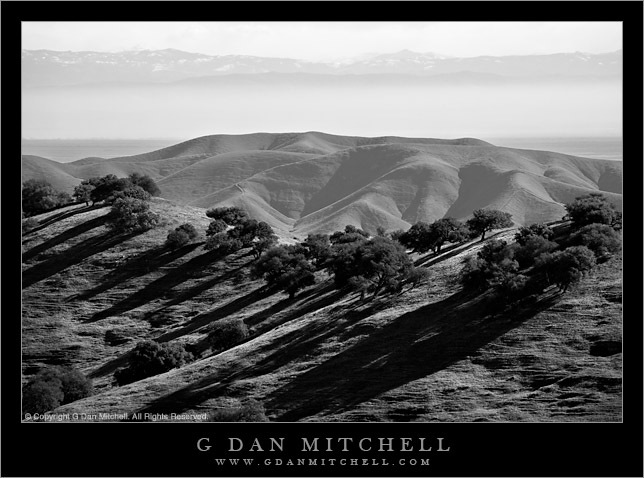 Eventually I wound my way up onto a high ridge along the crest of this portion of the Diablo Range, with extensive views in all directions. To the south there was a bit of snow on somewhat higher peaks; to the west I could see a few clouds forming under the marine air influence; to the north the burned areas of Coe Park were visible with Mt. Hamilton beyond. But the real treat was to the east – green, folded, oak covered ridges in front of me, the San Luis Reservoir beyond them, and then across the wide Central Valley almost the whole Sierra Nevada range was visible on the horizon. From Pacheco to the Sierra. Pacheco State Park, California. March 16, 2008. © Copyright G Dan Mitchell – all rights reserved. I continued on along the ridge – in astonishingly strong winds – until I finally reached the “summit” of Spikes Peak. It is the tallest spot on this ridge, and it affords quite a view – but there were higher peaks in several directions. After a quick jaunt back along the ridge and then down to the parking lot the way I had come, I was back at my car by noon. I haven’t check in here in a while but as always great minds think alike. 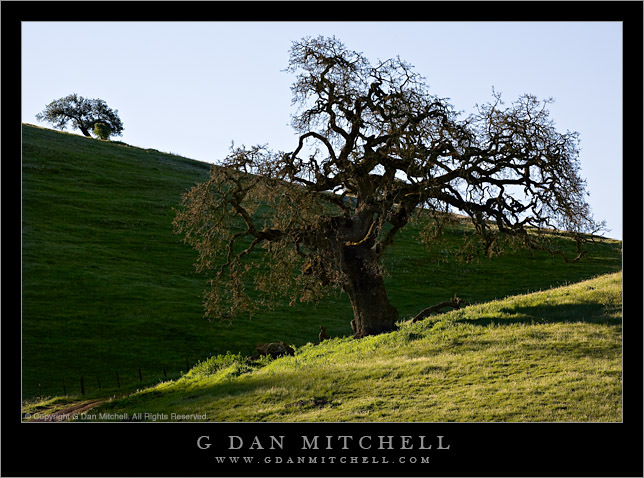 I was photographing Oaks in Pacheco State Park this past Wednesday. The hills aren’t as green as they were when you went and there were flowers, but not carpets of flowers. It was a pleasant visit, but definitely not peak. I would imagine in the coming weeks the hillsides will continue to brown. Regardless of color this area is quite beautiful… as your photos so effectively show. I came back past those hills on my return from Death Valley and Southern California last weekend. Oddly, the Pacheco Pass hills looked positively green compared to the other places I had come from. I do, however, think that we are pretty much at or just barely past the peak of spring flowers in these particular hills, as there is a definitely underlayer of dry brown grass coming in now.